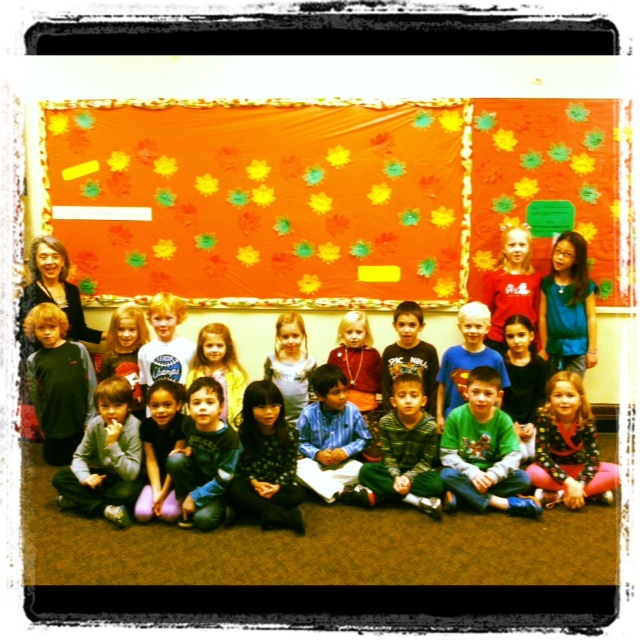 This submission is a great follow up to Lucila’s blog post: “A Double Life”. Thanks to Tyffanie Ammeter for sending us this heartfelt testimony of how this project has touched her and how she has taken the practice to a new level personally and professionally. You have made us so proud of you and your success at Columbia University, Teachers College. Thank you for being a champion! 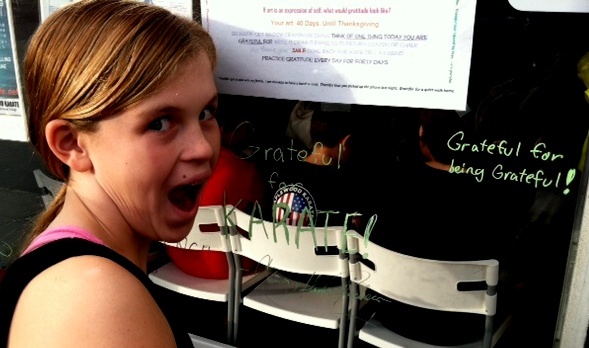 “When I first heard about The Gratitude Graffiti Project from Candice in June 2013, I was blown away by the idea. I thought it was such an inspirational way to foster the all-important quality of being grateful. It was something that struck a chord with me. I was at a point in my life where I wanted–and more importantly needed–to cultivate a sense of gratitude. I appreciated the value of doing the project leading up to Thanksgiving…not only for the obvious reasons of what Thanksgiving represents, but also for the fact that the holiday season seems to be so hectic and material possession-focused that we tend to forget about all the things we already have. What better way to remember and get the whole community involved? But I couldn’t wait until Thanksgiving. So I thought of way to do it right in the middle of the summer. I emailed a bunch of girlfriends, explained what the project was about and told them that I wanted to create a virtual space where we could all participate. Twelve of my best friends, located in places such as Chile, Australia, Germany and all over the US, were eager to participate and we got started on June 10, 2013. For 40 days, I would send out an email every morning sharing what I was grateful for, and throughout the day each person would reply all with their gratitude. So every day, I would get 12 replies to my original email, filled with thoughts of thankfulness of the things going on in each of their lives. This project caused a profound shift in my perspective. I could slowly see how I was able to be genuinely more grateful for everything in my life, even during challenging moments. I also felt increasingly happier…sometimes to the point of tears. Aside from these personal changes, this project also allowed me to feel much closer to my dear friends. It isn’t always easy to stay in constant contact with my friends due to time differences and our busy schedules, but even receiving a one sentence email from each one of them daily made me feel immensely more close to them. Even though they weren’t writing me with updates in their life, I could gather what was going on just from what they shared each day. It was a beautiful experience and many of them expressed similar changes in happiness as a result of participating. I loved this project so much that I decided to implement it in two ways during the actual timeframe (Oct-Nov) it was meant to be implemented. 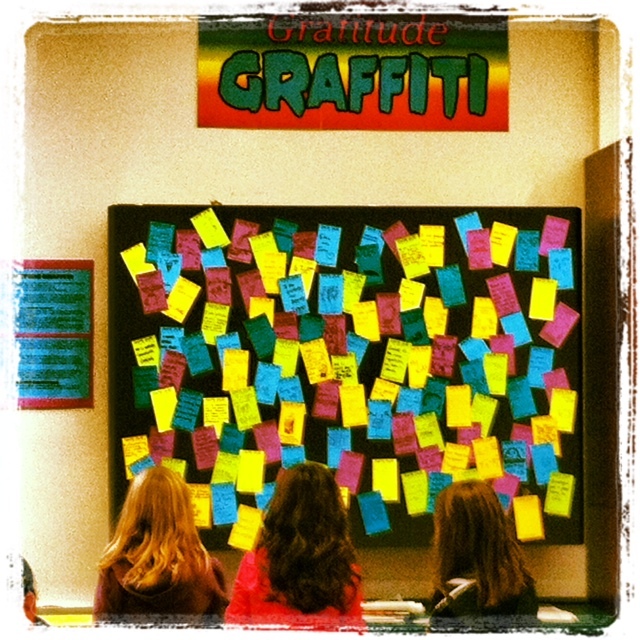 First, I decided to do a second round of virtual Gratitude Graffiti Project with my friends. I emailed more friends and 11 of them (some were first-timers, others had previously participated) joined in! Some were new friends from graduate school, some were friends I’ve known since I was 10 and it was fantastic to share another 40 days of gratitude with them! Secondly, I took the idea of The Gratitude Graffiti Project to the Office of Student Development at Activities (SDA) at my graduate institution, Teachers College, Columbia University. SDA loved the idea, especially with respect to how it helps build community and thanks to a student worker in the office, Katherine Worthington, we were able to implement the project at Teachers College. We modified it to suit our community, but we had great results in the end! This video (http://www.youtube.com/watch?v=KPRlzSVgDvg&noredirect=1) gives a great overview of how we implemented it at Teachers College and what it meant to everyone in our community! Looking at my life from the outside, most would agree that it has been a “success”. I have had a successful life coaching career, reaching and exceeding most goals I set out for myself. I have a healthy family, a husband, three well adjusted daughters and a beautiful home in an idyllic tree lined street. From the inside, however, I have struggled with feelings of anxiety, depression and “not good enough”. What a double life for a life coach and optimist like me. For as long as I can remember I have been on the search for happiness. What I hadn’t realized is that I had unconsciously “bought into” one of the most prevalent beliefs of our society today – the belief that Happiness comes from something outside of ourselves and it will come (for real and everlasting) when we finally reach whatever we deem as “perfect” in our minds. The “perfect” job, the “perfect” husband or family, the “perfect” Zen, even. I achieved my “perfect” world over and over again, and within minutes, hours or days of achieving my goals I became desperate and disappointed, judging my achievements and suffering through my search for happiness, ready to reach for the next level of “perfect”. This belief came with a huge consequence: I gave up all control over my happiness. I was so busy worrying about controlling, blaming others for my problems and wanting so badly to reach my goals to feel “good enough”, that I could not see what I already knew deep down. My “a-ha “moments felt freeing as if a huge weight had been lifted off my shoulders. The chase was over. I had it all backwards. My happiness was not something I had to wait for but something I had to train in, from within. But here was my big dilemma. How do I train from within to feel happy? How do I develop inner peace? (Which I knew was the way to feel happy and positively transform my world). How would I nurture my heart? It started with a shift in belief that I CAN train my mind (like we do the muscles in our body) to feel happy. I needed proof and I got it. What I have since discovered is a set of practices that if contemplated, studied and used can single pointedly and methodically nurture us from within and transform our world. One of these is the practice of gratitude, so simple that it’s often overlooked as a skill to develop, a choice in lens from which to see the world moment by moment. And this is why we, along with now the many volunteer community champions, decided to bring the practice to our communities through The Gratitude Graffiti Project. Realizing that we need support and the reminder to practice gratitude our project is now part of towns all over the world helping people develop this life changing skill. 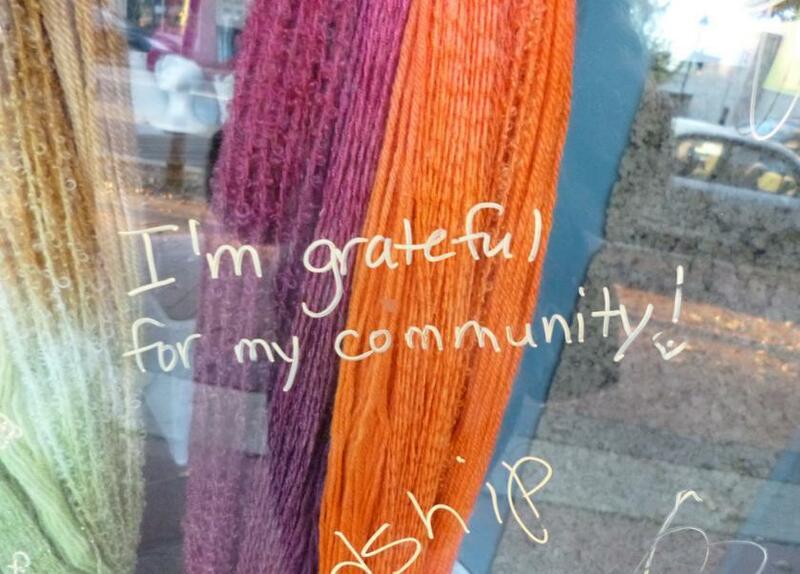 Within one year, our “gratitude stops”, inviting people to express their gratitude on windows, ribbons or paper, are in over 130 locations from NJ, to California to Canada and Hong Kong, including schools, hospitals, retail stores, a hospice, restaurants, coffee shops, libraries and your homes. As many of you have now reported, our project provides the “how” and it’s so very simple. 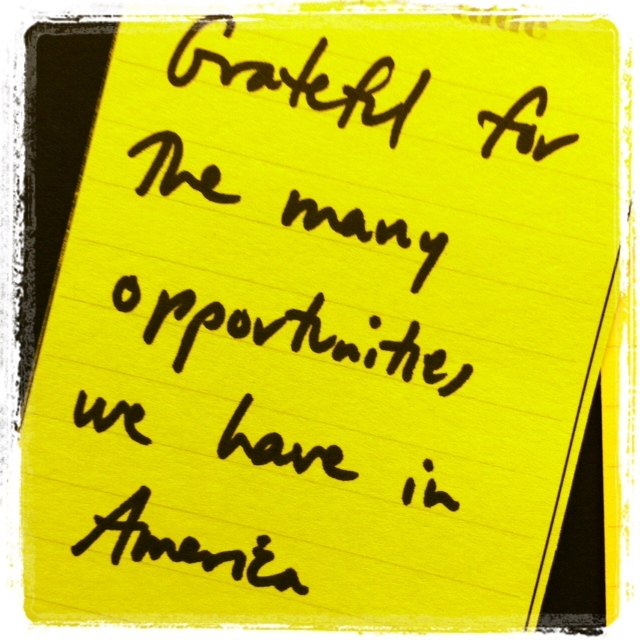 What are you grateful for this (American) Thanksgiving day? 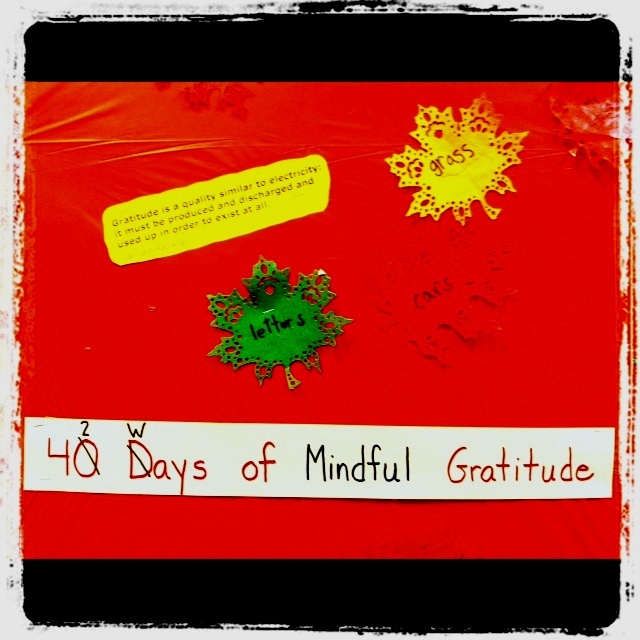 Day 10: how do I get the most out of this practice of being grateful? As I have a brief moment to reflect on Day 10 of the project, it is growing by leaps and bounds- more than we could have ever imagined. It speaks to the message of the project, far beyond any one of us and we are thankful for all the people who have opened their hearts and minds and space to this singular idea that we all have something to be grateful for and life is pretty good. In fact, it is a gift. This morning as I went for my run, the day was just breaking. Was my first thought- “Wow I am grateful for this day”? Honestly, I was preoccupied with other things. 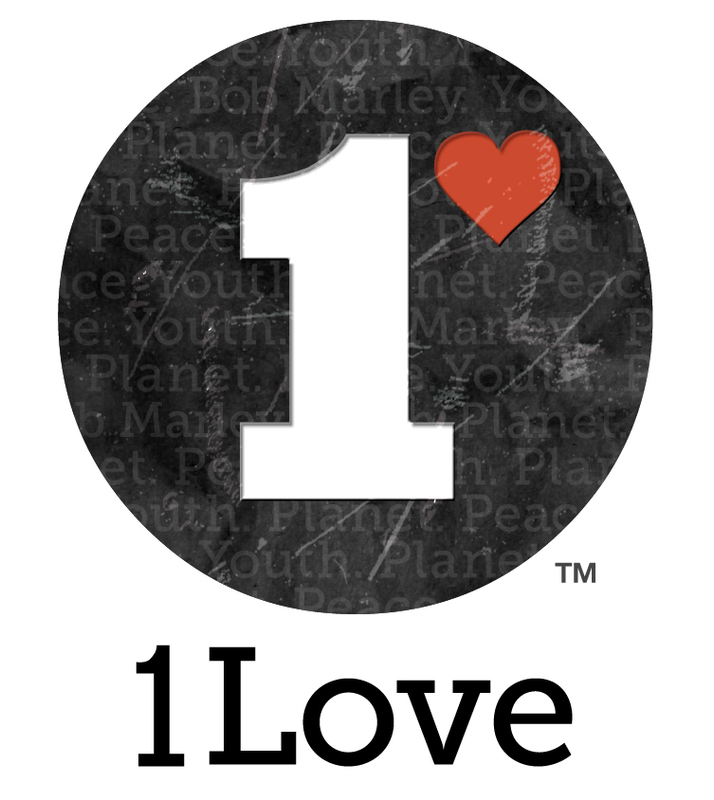 Contemplate this: if you only had one day- one day to express what you were grateful for- what would you say? Too often we let the moment pass without saying a word of kindness that we genuinely think but have not way of epxressing it. We are full of wonder at our children but have we let them know? Or the kind neighbor who did a kindness for you, the friend who smiled at you when you needed it? Someone who held the door? So as you move through the project and hopefully you have been practicing daily- go deeper into the practice; think about a kindness someone has done for you today, a loving act that someone has been doing for you, everyday that you have taken for granted. Be in the moment and grateful to be breathing- to have choices- to smile- to walk- to hold someone’s hand-to laugh in good company- for your food- to have a moment to yourself. And hold onto that moment beacuse it is a gift that belongs to you. Today we welcome so many big and beautiful changes. 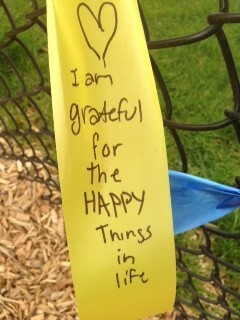 Maplewood, New Jersey came out today swinging with The Gratitude Graffiti Project. 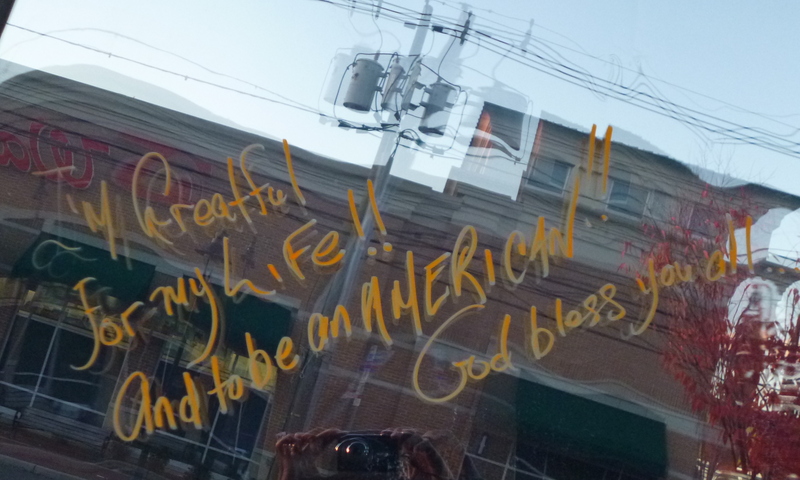 To walk around town and see the store windows with messages of gratitude at every corner of town was amazing. Two things struck me that I like to remember as I end the day reflecting on this project. One was an employee at a local store when asked to pick a marker color for their window this year, thought about it and mentioned casually, “Wow, is it that time of year again?” She smiled and walked away. But that made me feel like we were doing it, we were creating something for people- some consistency that we brought good tidings for that time of year. 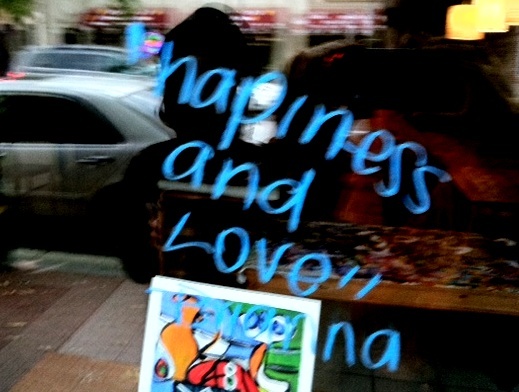 Flash forward to a few hours ago when I was walking around town, checking in on stores and enjoying what people wrote, there were so many messages but I particularly love the writing of children on the windows stating simply, “I love this place”. Yeah, I have to agree. We are so excited. We can’t wait to share this incredible partnership with all of you. Stay tuned and we will reveal over the next couple of days! What happened while we were on hiatus? In preparation of what was to come, we added a page to the website to instruct people on how to do the project next year in their hometown (like our picture?). Ack! Lucila moved back to Vancouver. What will happen to the project? The goodness keeps flowing on this project- two local media artists, Primal Productions and Bleu Moon Agency and local actor (and sound studio engineer) Kevin Kraft, volunteered their time in the fall to create a video for the project. With the editing wonders of Blue Rock and Denise Petrizzo, NYC we have a beautiful finished product that visually captures the vitality of the project. We are very proud of how it highlights the magic of Maplewood, its residents, our stores and the library system. Today is the day, American Thanksgiving, marking the 40th day of our 40 days of gratitude. Throughout the 40 days we have heard from many of you to let us know how gratitude has transformed your life. We have heard of how it has touched you, and how it helped you to give to others, in richer and more meaningful ways. To all of you who have participated in the project, for one day or forty, online, on the windows, on a card or in your mind, we thank you. Today, let the following soul-stirring quotes provide 12 reasons to be grateful. 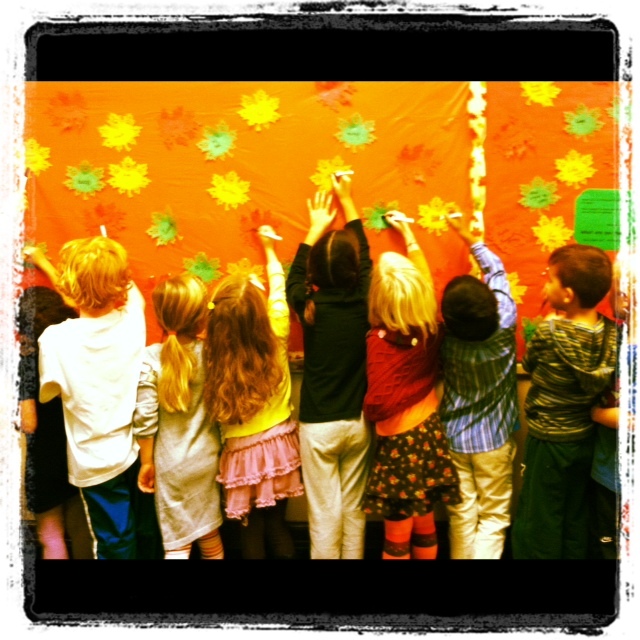 And let these first graders, in their eagerness to write down one thing they are grateful for at Tuscan Elementary, provide a backdrop for how simple but powerful gratitude can be. Yesterday they allowed me to witness some of their mindfulness techniques in action. Today, I hope they bring a smile to your face. Day 39: My barn burned down. When did the bottom fall out on you only to lead you to something better? My first barn “burned down” moment was when my parents decided to move from Spanish speaking Argentina (where I had friends, cousins, and 4 grandparents close by) to English speaking Vancouver, Canada. No English, no friends, no family, no comfortable surroundings. I was twelve and it seemed at first like this was going to be the end of me. Well, it turned out to be a life defining transition. One that has made me stronger and has instilled a belief in me that if I can do that at twelve, I can do anything. Having to learn English, make new friends in a new country miles away from home, trying to fit in (and not knowing the rules), being “teased” for my accent…and getting through it, not just surviving it but really shining. I went from being a shy, stay close to the teacher and mom kid to being a social butterfly and comfortable in most situations. Having had this experience has given me a perspective that supports me in taking risks, getting up when I fall down and “going for it” even if I don’t know what life will look like on the other side. Something I am grateful for. So, how about you? When did the bottom fall out on you only to lead you to something much, much better? “So Grateful 4 You!” and in my friend’s mind she thought that the writing on the wall meant that her favorite store was closing. She quickly parked, jumped out of her car and ran into the store and asked the owner if she were closing. The owner reassured her that business was good and that they were participating in the project and all was right with the world. But that got me thinking: Do we find ourselves most grateful at the end? The end of a project. The end of an event. The end of a life..? Or have we begun a practice that is grateful for beginnings when there is nothing to take stock of, except possibilities and dreams; or in the middle when things are complicated and messy, or when nothing is happening despite our best efforts and we are frustrated because we just want to get to the end..or go back? Are we looking at every end as a new beginning? Or maybe sometimes, that all good and (not so good) things come to an end and we can be grateful for all of it at that moment. 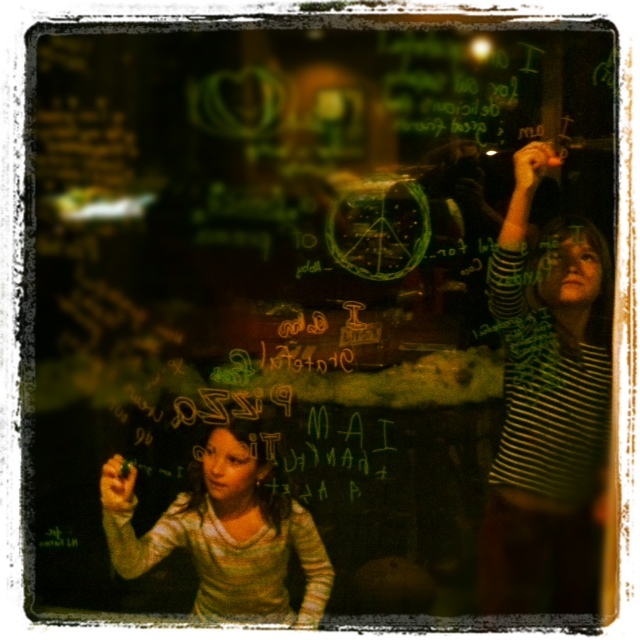 Have you stopped to write what you are thankful for on your personal ‘window’ today? 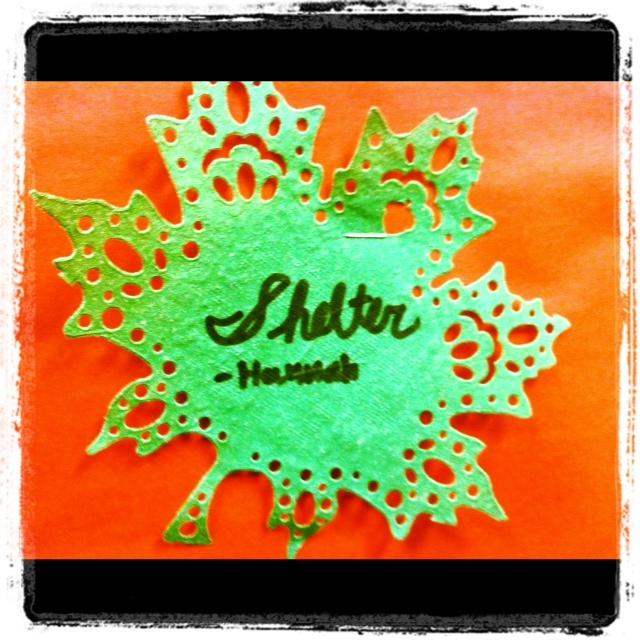 Day 35: This one will take your breath away. A few months after the accident. 6 months after! Doctors have told Cheryl that she has healed as quickly as a child. 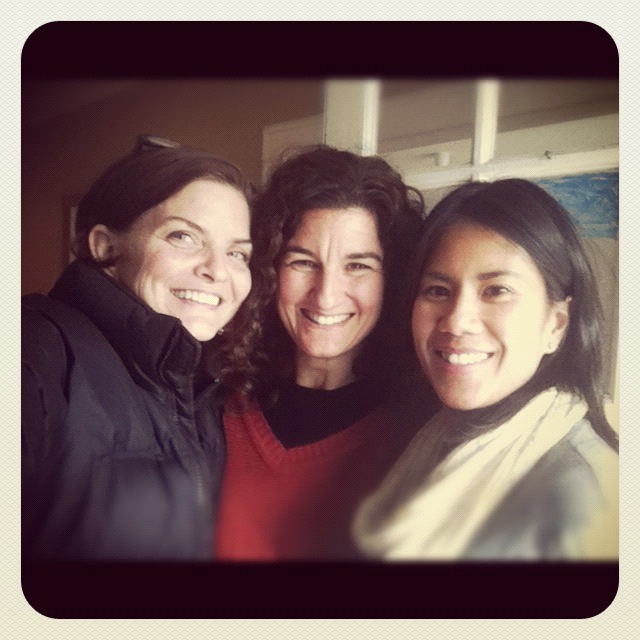 Candice and I met Cheryl Galante this week. This is an excerpt from an article written in NJ.Com by Craig Wolff. Cheryl Galante learned the virtue of being still when she lost control of her car on a rainy afternoon in May. When the vehicle came to rest, still upright, it had crossed six lanes of traffic and spun around. She was facing east in the express lanes of 78 west, staring over a spent air bag at what looked like smoke rushing from below the crumpled hood. Her thumb twitched on the seat belt latch. “I got to get out of here,” she said. Her mouth was dry. In a haze, she could not decipher the face except that it was kind. She made out a black T-shirt and grabbed at it. Nothing made sense to her, except for his voice, calm and unyielding, and these sure hands, which restrained her, and cradled her. For nearly 30 minutes until an ambulance arrived, while nothing indicated a devastating injury, his hands stayed right there. Had she tried to flee the car or merely been allowed to turn in her frenzy, her doctors now say, the odds are she would be a quadriplegic, or she would have died. Cheryl Galante, 52 years old, from Maplewood, was not pulled from a burning building. No one shielded her from bullets or stepped into the path of a speeding train. She was spared by an act heroic in its simplicity. ….From inside her halo, she said, the world appears filled with the helter-skelter of people rushing about their lives. She is grateful for an opportunity her accident gave her, to be stilled for a time, and to watch. The universe has slowed for her, she said. To read the full article and to watch a 2 minute video click here. Over the last ten days of our forty days of gratitude, I chose to focus on my husband. We have been married for over thirteen years and we have known each other for over twenty. Hard to believe. It is not always easy. Like life, our marriage has endured its ups and downs, ebbs and flows. Today I am thinking about what has kept our marriage going and what has kept me “in love” for so many years. I can’t help but think about what a a therapist once said to us: “work out a way (a mechanism) to deal with conflict”. We listened. Part of this mechanism is about how we communicate. The other part is about what we don’t say but believe and see from our perspective (which will affect how we communicate). My perspective sometimes? (and one that kills my “love”) : I sometimes forget that he is human, with his own history, his own patterns and his own interpretation. I desperately want him and our relationship to be “perfect”. I want us to have the “perfect” relationship, with “perfect” children, fun and joy ALL the time, and no conflict. As Sam Keen so beautifully wrote, by seeing Kevin perfectly imperfect it allows me to feel love. It allows me to feel more compassion. It also allows me to inquire rather than judge. To persevere rather than quit. To love rather than resent. Funny, isn’t it? the more I want the “perfect” person, the more I fall out of “love”: the more faults I see, the more mistakes I catch, the more inconsistencies I judge. I am imperfect, Kevin is imperfect and our relationship is imperfect. Perfectly imperfect. Seeing this is love. One of the most beautiful things about this project has been its ability for people to be perfectly candid in their expressions of gratitude (in what ever form they may make it- at the library, on a window…). Does that come with anonymity? The freedom to say how you feel so openly? Testimonials thus far say that there is happiness that comes after engaging in such an act of openness with ourselves. And there it is on display. For all to see. One thing this project can teach us is this: don’t hold back in expressing your gratitude. It can be cathartic, uplifting, rejuvenating, releasing, and down right awesome. On that note, if you have been following this project for 1 day or now, 34 days, sometimes our feelings of gratitude call us to do more. Whether that be writing a thank you note or calling someone to say a long over due ‘thanks’ or whether that be giving in the form of charity. Check out our link to ‘Charities that Jumpstart Gratitude’ above to tap into spreading some of that goodness along. The great thing about ‘Gratitude’- there’s more than enough ways to not only feel it and express it, but it can spur you on to take the first step in changing the life of someone who would be ever so grateful to you for your effort. So go ahead. Don’t hold back. We must not only give what we have; we must also give what we are. 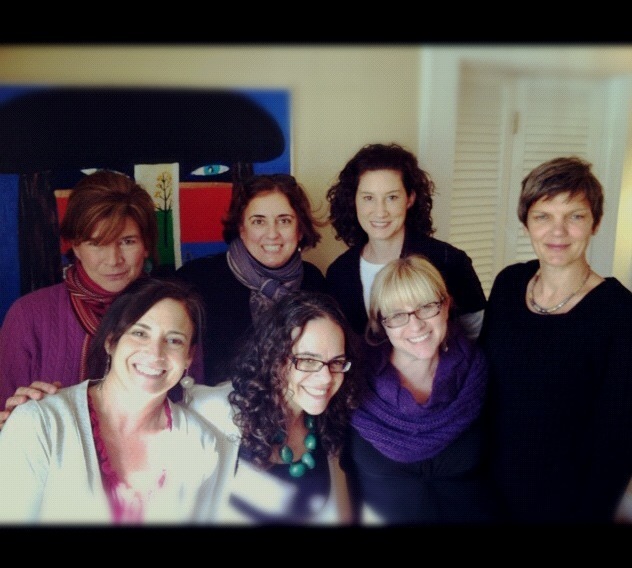 Every couple of weeks, I meet with a group of women who are givers. They give their time to charities and school and of course they give to their children and partners. But this is not the kind of giving I mean. They give me and each other what they are. It is easy to get lost in our roles as mothers, friends, aunts, wives, teachers, volunteers, givers. We go, go, go all day seeing others at a distance in places like work or school pick up. We take and pick up our children from their activities. We cook, we clean and repeat. But behind all these roles and activities we are all the same: human beings who want to be happy. And for a few hours every other week, we get to suspend the roles we stand behind, we take a sneak peek behind the doors and speak the truth. Sometimes it’s scary to speak of our fear out loud, or speak of the side of our self that we don’t admire and often judge. But by so doing, we are giving each other connection. A human connection that is often missing when we are busy running around, searching for things or activities that we believe will make us happy but often leave us disappointed or lost. So to these women, you know who you are, I say thank you. You have helped me give and humbly receive meaningful support that makes a difference in my life. And for this I am deeply grateful. Who can you thank today? 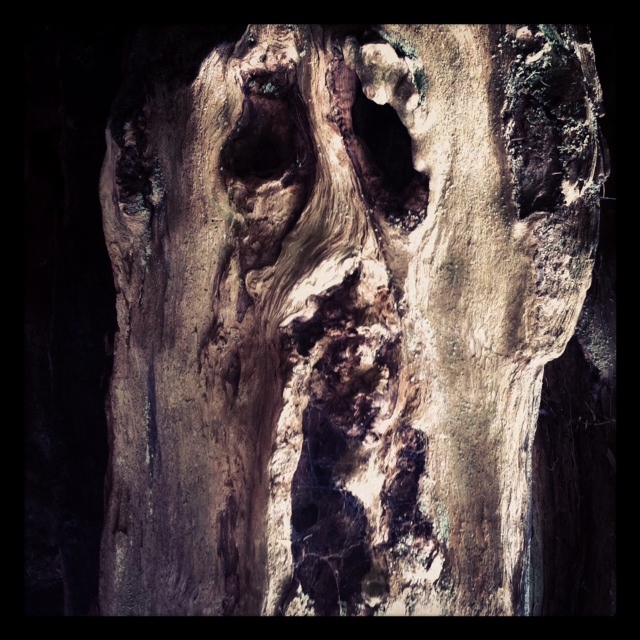 Even the trees were screaming. The next storm is coming. It might be external, like the one we just experienced, or internal. Question: are we prepared? Flashlights, check. Batteries, check. Bottled water, check. Clear mind,…not so sure. There is something we can do internally to prepare for what life throws our way. One small problem. Most of the time, we don’t place a lot of value on our internal preparation and we don’t even know what steps we need to do this. We are stopped before we even get started. So what can we do? To start we can take a moment to contemplate and reflect. Sometimes we fail to see the truth as we are whizzing by. We need to stop, think, feel and absorb into the beautiful space of gratitude that lies deep within our heart. When we start to feel the benefit of this view, beyond our chatter, beyond the busyness, we will have an incentive to do this more often. It is then, that we might start to see that everything is transitory, even our joy and the things we take for granted. When we search deeply inside our minds and hearts we might find the hidden jewel of impermanence which will then grow our gratitude for each moment. Day 30: Did it take a hurricane? 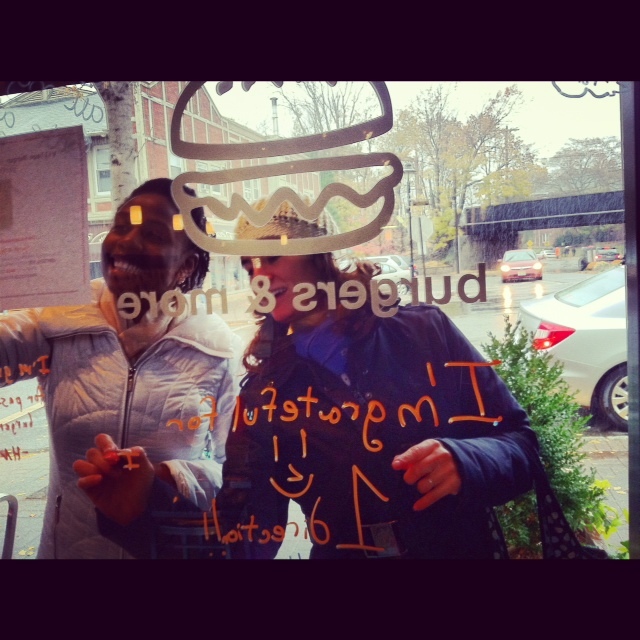 Thank you for your enthusiastic response Village Burger! With only ten more days to go on our project, it made me wonder: “When are you most grateful?” After the last few week’s events, I have pondered this, and the following questions, for myself as well. 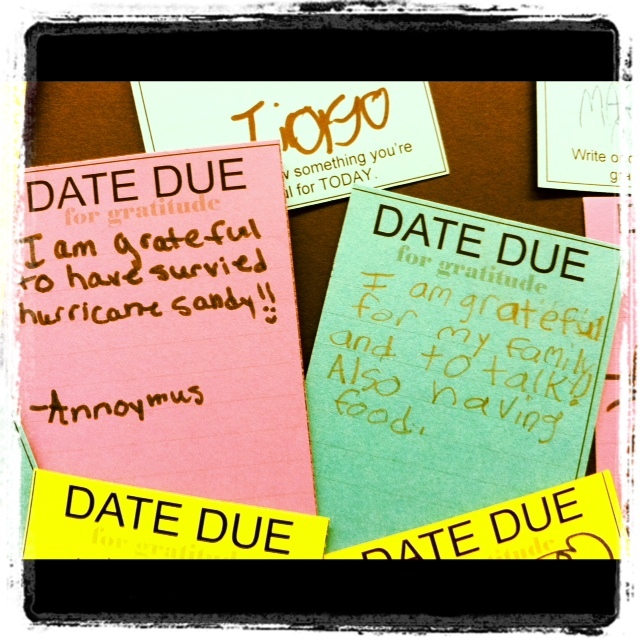 Did it take a hurricane to make you feel grateful for what you took for granted? A refrigerator light. A blanket. A neighbor and the sound of their generator supplying you and your family with heat. The enveloping darkness of an early fall night. A candle. The comfort of your own bed. The voice on the other end of the phone saying, they made it through. Are you able to feel grateful when you are swimming in excess? Are you able to quiet your mind among the litany of ‘to-do’s and be grateful for a simple breath? Or are you now able to take stock of what is important and has always been there all along? When we recognize, at whatever stage of life- at whatever time of day- and whatever life condition, that we have enough (and more) it is then that we can embrace thankfulness as an engaged being, for all that we are given. I visited our local library this morning and was inspired and humbled by the hundreds of messages people had written on the “Date Due For Gratitude” wall. The library was daily refuge for thousands of people without power after the storm and the wall became full with beautiful messages of hope, faith, love and gratitude for many of the things we might otherwise take for granted in our busy lives. One of the aspects I love about writing daily is that I am always on the look out for inspiration, something to learn from or something to share. It’s a very scientific study of 1 analyzing whether I can indeed find what I am looking for and if so, how exactly will it make me feel. More specifically, will it change my mood, my thoughts, what I say, my actions? …and there it was in front of me. A succinct 11 words that describe how I feel when I cherish others: great within. In my humble study of one, the cause and effect is clear: cherish others and feel great. I invite you to think about who you are grateful for. Recognize their greatness. You too, might like the results. Our newest participant: The Towers at Rutgers!! A couple of years ago my husband celebrated his 40thbirthday. He is a “take control” kind of guy and planned out his own present: a week for the two of us in Mexico. I decided that for this special birthday I was going to outdo him but how could I surpass a week in Mexico? After months of brainstorming I suddenly had an idea. What if I could celebrate his greatness for 40 days? I know. It might sound a little nutty but what do you give someone who has everything? (or maybe that was the excuse I made up for not wanting to be materialistic). The idea was born and I knew that he would love it (what can I say, my husband loves attention). But what I didn’t know is that this idea would change my life. So“40 ways in 40 days to celebrate Kevin’s Greatness” became a reality. 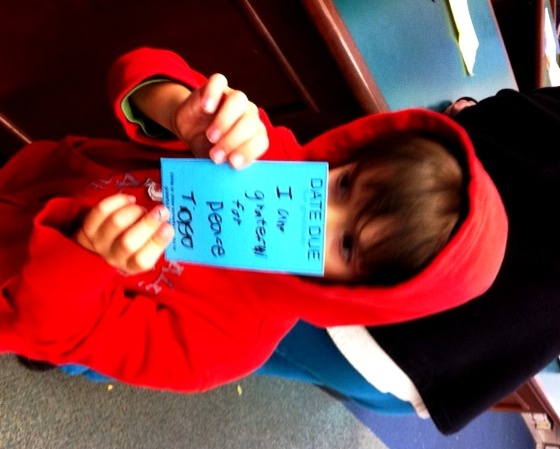 During one of the weeks, he received daily cards from our girls listing one “thing we love about dad”. Another day, the girls and I surprised him and took him to a velodrome (he loves cycling) and all of us received lessons. About half way through the 40 days people started to comment that I seemed different, calmer, happier. “What have you changed in your life?” they would ask. “Nothing” I would answer “but I agree with you, I feel happier than ever.” And one day it dawned on me: in the process of acknowledging my husband’s greatness I realized how lucky I was to have him. I was focusing on what I was grateful for, and someone other than myself. Without realizing it, I had started a gratitude practice and it felt marvelous. So when the 40 days were over, I couldn’t stop. It felt too good. 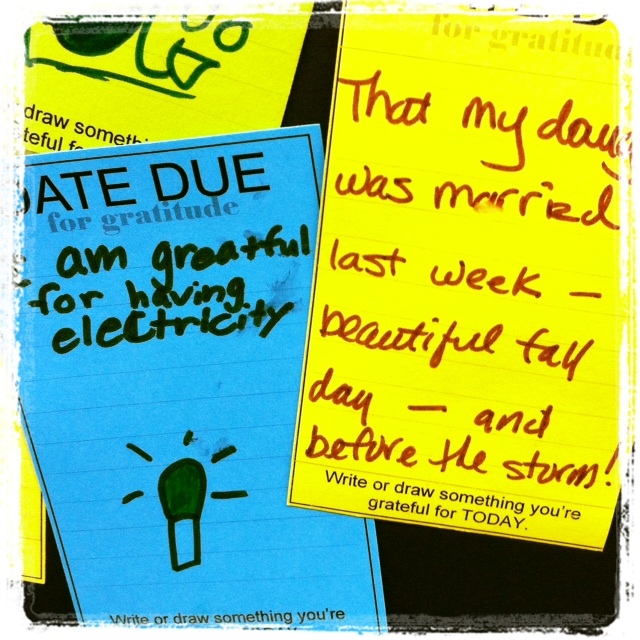 Since then, I have experimented with various ways to keep gratitude alive. I am learning to meditate and I have become a Dharma practitioner. My life isn’t always Zen. Well, it’s not the Zen I always thought I wanted-the perfect ending Hollywood movie kind. But you know? Focusing on gratitude has allowed me to acknowledge (and even welcome) the ups and downs that I experience as a human being, as a mother, a friend, daughter and wife. I am now able to experience prolonged periods of peace of mind even amidst my very real, non-Hollywood life . My new Zen. And for this I am grateful. What experience are you grateful for? 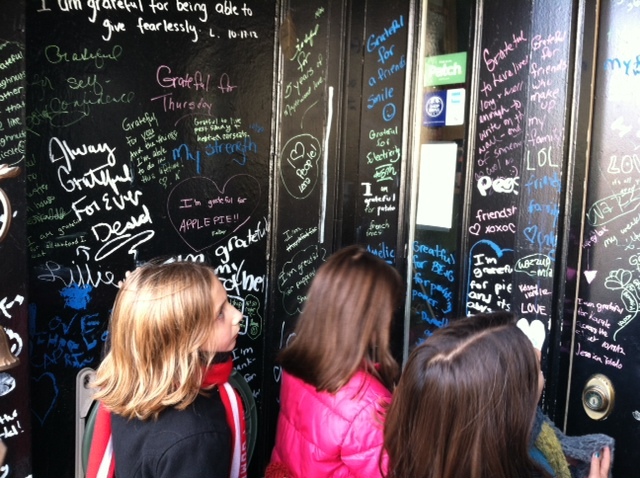 Gratitude Graffiti from the Hair Chalet. Our nation and region showed great courage and determination yesterday to mobilize ourselves and each other, to get to the polls and take advantage of our civil right to cast a vote for our governmental leaders. We walked. We stood in line. Not for gas. But for something that meant something to us. Some of us without power, some of us transported far from our homes, we overcame such things and made our presence known and our voices heard. Maybe reflecting on this election day, in the wake of response and recovery from Hurricane Sandy and hunkering down for another pounding by a Nor-Easter, we can be grateful that we are made of a stronger will than we thought we were. Grateful that we are a resilient family. Grateful that we are a community that does care for its own. Grateful that we have the means to lend a hand. Grateful that we can cry and then pick ourselves up and move forward. Grateful to wait in line so our voices are heard, and know in a sea of people, we are not alone. We are here. We matter and that today could be our greatest day yet. 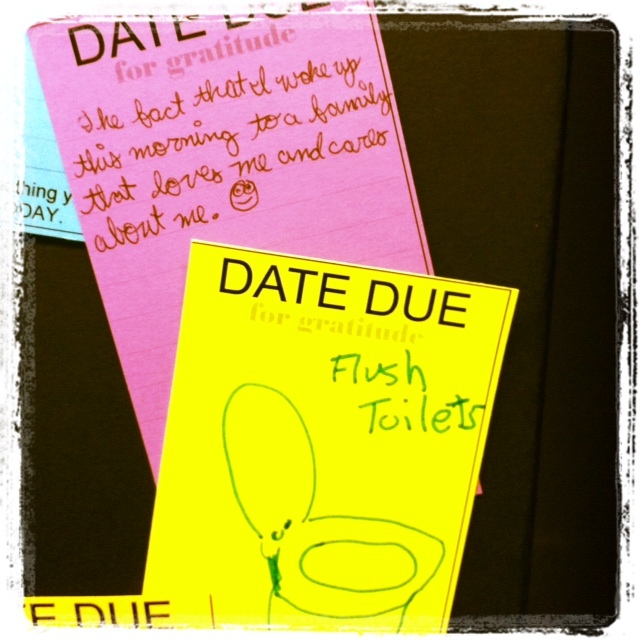 Sometimes our greatest day can start with a personal practice of thankfulness. Many of the buildings around us (including both schools our girls attend) are still without power. 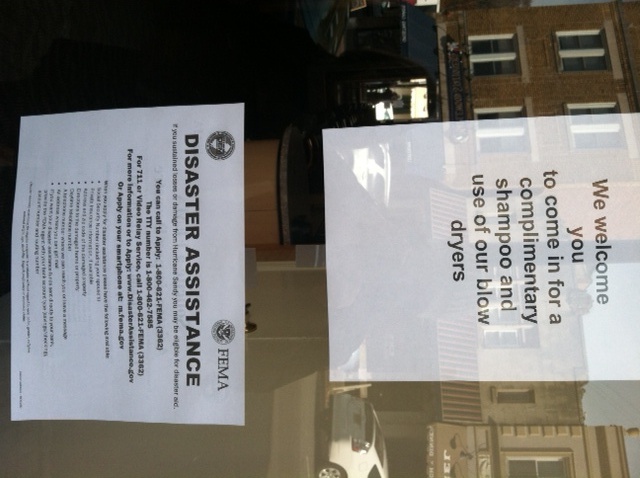 As we walk around town I am touched by the signs on the windows, like this one at Anthony Garubo: FEMA disaster relief on one sign and complimentary shampoo on the other one. The expressions of gratitude are growing. Like this one at Lotus Petals. Peggy, the owner, mentioned that during this difficult time she has noticed people wanting to express their gratitude even more than before the hurricane. We are going on our second week of no school. I continue to be grateful that we are safe, warm and able to help those in need. What is one thing you are grateful for today? I agree with Tiago. I am grateful for how peaceful our town has dealt with this disaster. Peace is visible in all the stores in our village who miraculously did not lose power and continue to offer a cup of coffee and a place to charge our phones. Peace is visible at our neighbors’ homes, helping each other with food, warmth and a place to sleep. Peace is visible at the library where thousands of people have gathered throughout the last week to stay warm, re-charge and connect with each other. 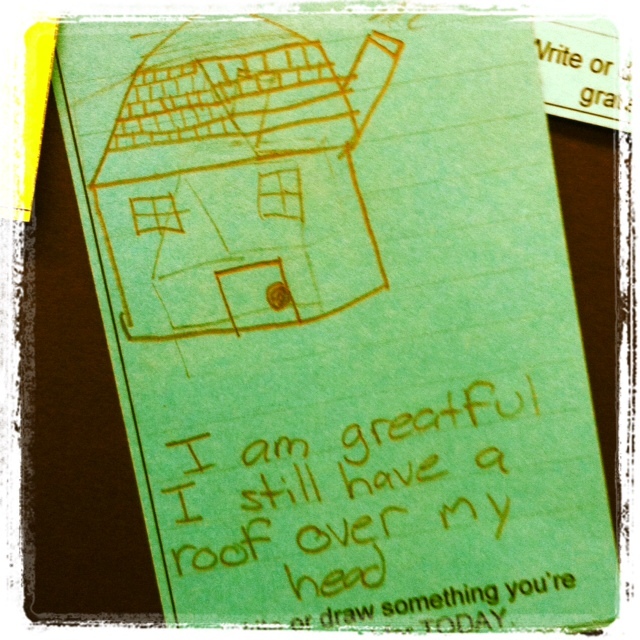 What are you grateful for in your own neighborhood? Last year, six of us were scheduled to go on a surfing trip to the Jersey Shore. I got a call from the instructor minutes before leaving the house to let me know that the waves and the wind were too high and dangerous for us to try surfing. Without hesitation everyone agreed that we would still drive down to the beach and make the best of this day. We arrived and as predicted the wind was blowing hard and the red flag was flapping strongly on the mast to warn everyone to not get into the water. All of us walked down to the beach, took in the majestic views of the waves and we simply stood there in awe. We went with the flow throughout the day and found a small more protected beach. We learned Tai chi and in the end we learned how to paddle board and “surf” without the waves. I am certain that what made our day so memorable was everyone’s intention to make the best of it, to have fun, to enjoy, to learn, to be together, to just be. To be present. And while every day is not going to be “a day at the beach”, that “surf” day taught me to continuously nurture my intention in order to become more present. Becoming more present can positively transform the way I feel about my day and each small or large task that fills it. Day 21: When everything seems out of control. We have been one of the lucky ones. We have power in a town where 90% of our homes are still without it. We have extra rooms for our friends to stay with us and we have plenty of power outlets to help our neighbors charge their electronics. Who knows if I will continue to have power today or if a tree will fall on my house. Nothing is permanent and we can can’t control anything out there, yet we want to, don’t we? I know I have been lucky to have a moment to pause and ponder a bigger picture. We live our lives “making rules” that determine what NEEDS to happen for us to feel good. Think about it. Do you have to have someone “respect” you to feel good? Do you have to make ‘X’ amount of money to feel happy? Do your plans have to go exactly as “planned” to not feel stressed? Do you have to achieve all your goals? Do you have to be spiritually evolved or wait until you achieve total enlightenment to feel good? Today, I invite you to see that absolutely nothing has to happen “out there” in order for you to feel good right now. A challenge in these difficult times, I know. What does this mean? It means that today, when you experience a “tough” moment, you “see” things through a different lens. Not one that determines your peace of mind by what happens to you from “out there” but one that is within you to CHOOSE how to act or react moment by moment. I am grateful to have power and running water. Our house is open for anyone who needs it! Halloween came went this year and due to Hurricane Sandy, we have not been able to celebrate outdoors. Now that doesn’t mean we can’t go a little gratitude crazy indoors, right? Enjoy this very short video made with love just for you.